I am working on a research project that deals with American military casualties during WWII. Specifically, I am attempting to construct a count of casualties for each service at the county level. There are two sources of data here, each presenting their own challenges. 1. Army and Air Force data. The National Archives hosts lists of Army and Air Force servicemen killed in action by state and county. There are .gif images of the report available online. Here is a sample for several counties in Texas. I DO NOT need to recover the names or any other information. I simply need to count the number of names (each on its own line, and listed in groups of five) under each County. There are hundreds of these images (50 states - 30-100 for each state). I have been unable to find an OCR program that can tackle this problem adequately. How would you suggest I approach this challenge? (I have some programming expertise in Python and Java, but would prefer to use any off-the-shelf solutions that may exist). 2. Navy and Marine Core data. This data is organized differently. Each state has long lists of casualties with the address of their next of kin. Here is a sample for Texas again. For these images, I need to BOTH count the number of dead and recover their hometown, which is typically the last word in each entry. I can then match these hometowns to counties and merge with database 1. Again, the usual OCR programs have proved inadequate. Any help on this (admittedly more difficult) problem would be very much appreciated. Thank you in advance experts! The answer to both data sets is an OCR application with some post-processing, but a more specialized program than a generic low-quality or an open source OCR. Essentially the harder the problem, the more capable and advanced tools need to be used to solve it. There will be two major stages in this task: digitizing the data (image to text, i.e. OCR) and processing the data (performing the actual count). Look at them separately in order to select the best method for each stage. a) images have low resolution. For example the # 1 image has resolution of about 72 dpi. Suggested resolution for such text quality is to scan at 300 to 400 dpi, but it is clear that re-scanning or controlling scan resolution is not applicable now. That’s why one option is to clean and increase the size using image pre-processing tools. This is what the original #1 image snippet looks like after adaptive binarization and zoomed at 300%. It is clear that each character has too few pixels and characters can be easily misread. b) GIF format in #1 is not supported by many OCR applications. Images need to be batch-converted to a different format, such as PNG or TIF. c) in these scans the backgrounds and bleed-through (shadow from the text on the other side of the paper) is visible. Good binarization needs to be used to remove background and bleed-through, but not remove vital parts of actual characters. After implementing specific pre-processing solutions for the items listed above, and then using a high quality OCR system, such as www.ocr-it.com API, highest possible results can be achieved. Result is far from perfect, but it is as high accuracy as it could be achieved with a modern OCR engine on these images. Luckily for this project, the data needs to be counted, so the second stage has all necessary data for reliable data post-processing analysis. Contrary to other basic OCR engines, the OCR provided by www.ocr-it.com API, which I used to produce the above recognition. OCR-IT API is free to develop with, and very inexpensive to use per page, so that may be a very economical but powerful solution for this project. It returns formatted text layout, including preserving line breaks and overall format structure. This makes text post-processing easier. A simple algorithm can be run to count the number of lines, resulting in the necessary for the research count. There is a second option to use an even more specialized OCR application called FlexiCapture with FlexiLayout technology. This powerful and intelligent data capture technology has built-in high-accuracy OCR, and it has a powerful rules and data analytics engine to perform very specialized user-defined chains of actions and tasks. The implementation of this method using FlexiCapture with FlexiLayout takes the following logical steps. First, full page OCR is performed and all objects are extracted, including characters, noise, black horizontal and vertical lines, white gaps, and objects (which could be pictures, logos, handwriting, etc.). This produces objects upon which we can apply our search criteria. 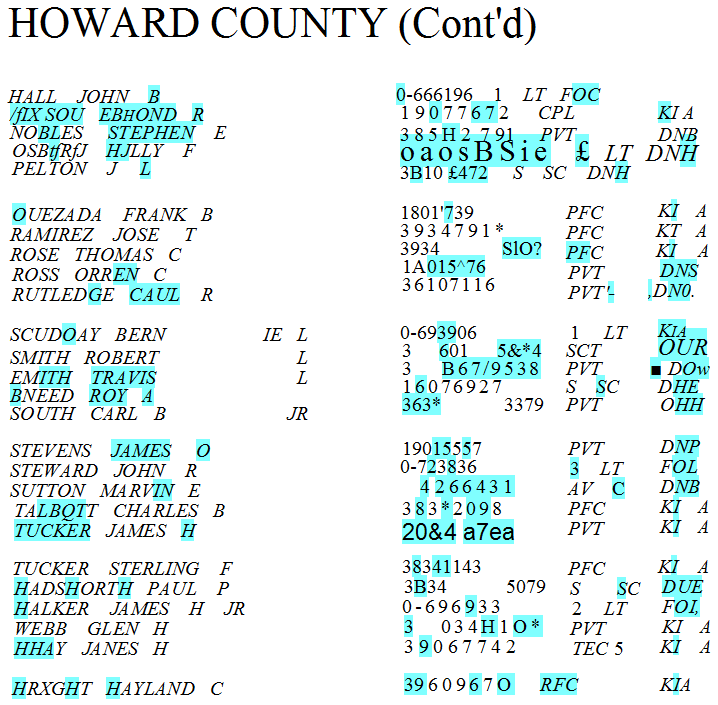 Next, the following constraints are applied to the post-OCR data analysis and search criteria: separate image into three vertical columns and run the following logic per column, use line-start as individual count, skip header/footer/indented lines (county names), assume each name to have at least three characters, find recursively every name starting from top to bottom in every column, exclude previously found lines. While the above logic sounds complex to setup, the actual setup takes just a few minutes and requires minimal work through user interface (UI) environment. No coding or programming is necessary. The following search elements and criteria have been created. RepeatingGroup consisting of a CharacterString search object. As the last step, FlexiCapture is instructed to return the number of total found elements that fit our search criteria, effectively producing the necessary data for the research task. There are other logic alternatives that can be setup in FlexiCapture, such as finding the number of white spaces between lines, or searching for the fixed-length fixed-placement 3-letter combinations at the end of every column linen. In conclusion, there are several options (which is always nice) how this task can be achieved with relative ease in effort and high quality, but the success depends on the quality of tools used and necessary knowledge how to use them. If you believe some of these tools and processes can be beneficial to your project, please contact my directly. I specialize in these workflows. Ilya @ WiseTREND. My company may be able to help with the setup or guidance. We have participated in various research initiatives, some through donations to a good cause. I included a configuration file test.config to tesseract in order to restrict the permitted characters. In this way, we don't obtain mistaken unicode characters in our text. As you can see, there are many mistakes, but at least we are obtaining reasonable results. In any case, you don't want to do this because even if you were able to get perfect recognition, some of your lines would be placed in the wrong county because tesseract is looking at your document as a big paragraph. I recommend you to use the vertical lines to segment your image into 3 parts and then preprocess each one of them. You can even try to concatenate the parts vertically and perform OCR in a single page. This also applies to the second image. By the way, the resolution of your image is not great, so if you can get a better image, that is going to make a big difference. In what way have the usual OCR programs proved inadequate? Do you have some example output that you find you can't work with? I can see how the columns complicate things. I'd say for data set 1: OCR the images, then read the files line by line and match on for instance a sequence of at least five numbers. So you get 0, 1, 2 or 3 per row. You may miss a couple due to the OCR accidentally recognizing a number as a letter for instance, but I expect this to work reasonably well. How precise do you have to be? Data set 2 seems more difficult. Maybe counting can be done by matching on capitalized sequences followed by a comma. Placename... very tricky. Once again, do you have some OCR output we can look at? Not the answer you're looking for? Browse other questions tagged dataset text-mining data-cleaning processing or ask your own question. How can I transform names in a confidential data set to make it anonymous, but preserve some of the characteristics of the names? Add extra term weight when grouping strings by similarity? How to use keras flow method? How to split natural language script into segments?